The Serotonin Revolution draws on the latest scientific research regarding serotonin, dopamine, leptin, and adrenals. Lowri Turner, TV personality and qualified nutritionist has created a diet to regulate these weight loss hormones and neurotransmitters. Most low-carb diets interfere with the ability of your body to create these “feel-good” compounds. However to stay slim and healthy you need them to be in the right balance. On this diet you can drop a dress size in two weeks while you enjoy delicious and comforting hormone-balancing meals. Serotonin Revolution makes a case against conventional high protein diets. They make us feel cranky and lethargic and only cause us to gain weight afterward. When you cut out the carbohydrates your body is unable to create enough serotonin, which can lead to depression. Low-carb diets also have many disadvantages including putting a strain on your kidneys and reducing your intake of vitamin C.
The Serotonin Revolution tackles the primary cause of overeating and cravings – hormonal imbalances. Once your hormones are balanced you have a reduced appetite, fewer cravings and more motivation to exercise. This diet does include carbohydrate foods in moderate and appropriate amounts. However, you will probably be eating less carbs and more protein than you are used to. Eat plenty of lean protein especially at breakfast. Balance your blood sugar to prevent cravings. Eat low glycemic grains and legumes and watch your portion sizes. Include plenty of essential fats to support healthy brain function. Always have an evening snack to prevent binging at bedtime. Phase 1 is the rapid fat-loss stage. This lasts for two weeks and allows between 1000 to 1200 calories daily. Your motivation is high at the beginning of a new lifestyle change so this phase is more stringent. Phase 2 focuses on more gradual weight loss. Your calorie count will range from 1000 to 1600 per day. You will be able to enjoy a wider variety of foods. You can stay in this phase until you reach your target weight. This phase offers a way of eating that you can and should be able to maintain for life. Turkey, lamb, chicken, salmon, shrimp, eggs, reduced-fat Greek yogurt, feta cheese, beans, lentils, brown rice, oats, quinoa, buckwheat, almonds, sunflower seeds, tomato, peppers, zucchini, cauliflower, mushrooms, avocado, banana, watermelon, figs, berries, agave syrup, xylitol, stevia. The following is an example of the Phase 1 Serotonin meal plan. 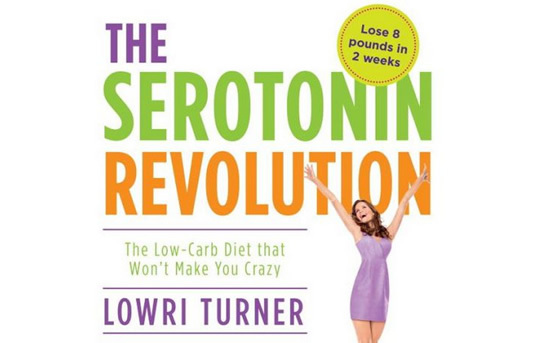 Serotonin Revolution: The Low-Carb Diet that Won’t Make You Crazy retails at $14.95. Includes four different 14-day eating plans so the diet can be customized to suit the individual. May improve neurotransmitter production, brain function and emotional health. Encourages consumption of a wide variety of fresh, unprocessed foods. Serotonin Revolution emphasizes low glycemic carbohydrates. Does not require calorie counting or measuring. Can be followed as a healthy lifestyle weight management plan. Some of the eating plans require elimination of many carbohydrate foods including bread, pasta and rice. Serotonin Revolution does not offer guidelines for exercise. Vegetarian meal options are not provided. The Serotonin Revolution offers four different eating plans designed to balance the most important weight loss hormones. This program will appeal to dieters who have struggled with low-carb diets. It offers a less extreme approach designed to enhance wellbeing so you are motivated to eat well and stay active. However, exercise is a huge component of feeling good since it releases endorphins and also helps balance hormones. Dieters wishing to do the Serotonin Revolution should also engage in exercise 3 or 4 times per week.